Please email me to inquire about any of these items for sale if you do not see a BUY NOW button. I am slowly, but surely, adding buttons. Thank you. Some items also available at my Etsy Shop. 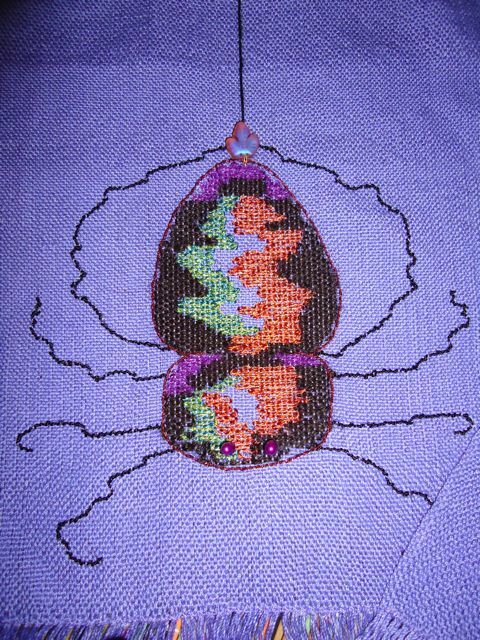 Sale prices apply to sales made through this website and Etsy only. A special linen lace panel. 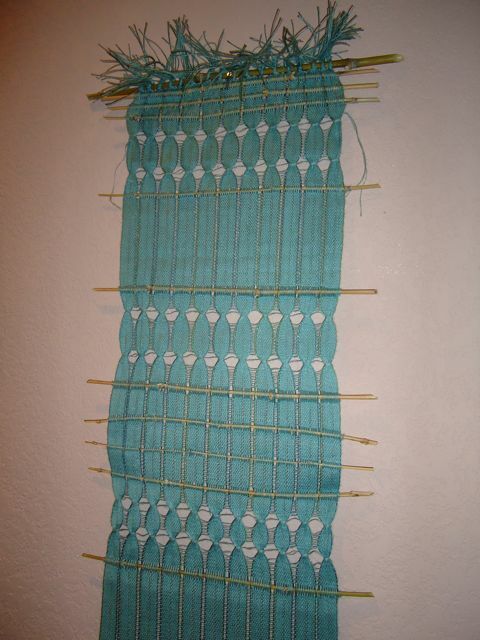 Aqua Lace Panel. Linen, rayon. 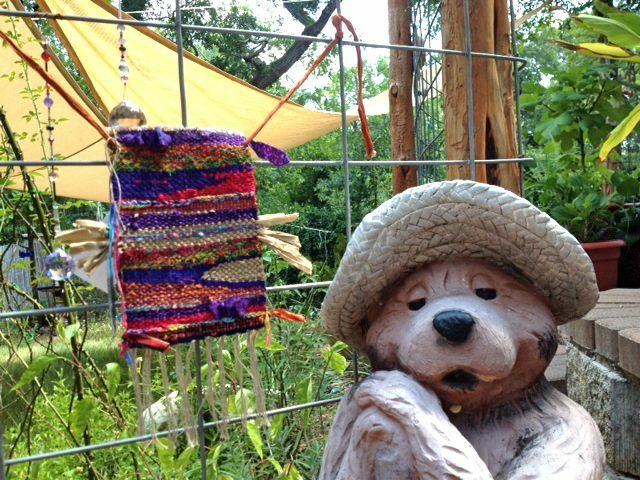 Bamboo sticks. 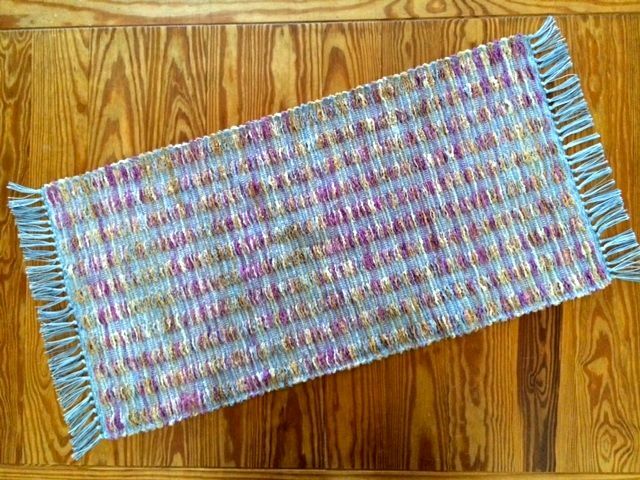 Handwoven on a 4-harness Baby Wolf loom, this piece is lovely as a wall hanging or in a window or glass door. $149. 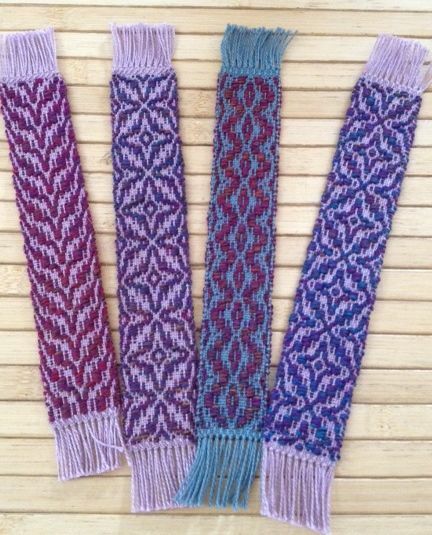 Inkle Band Bookmarks (SOLD). Contents: 100% cotton. 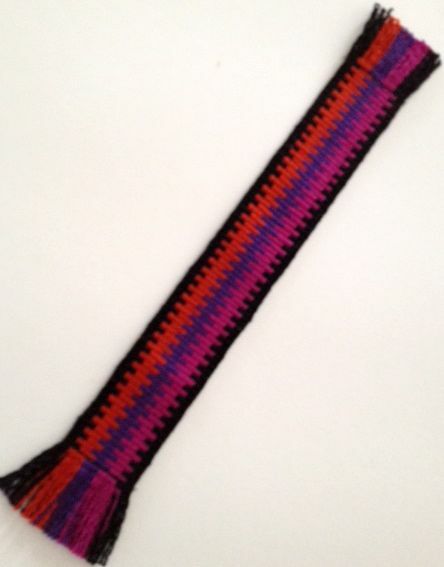 Overshot handwoven bookmarks. Contents: cotton warp, wool weft. SOLD. Thank you! Mug rugs / coasters. Set of 4. (SOLD). Contents: cotton warp, wool weft. $24.95/set of 4. 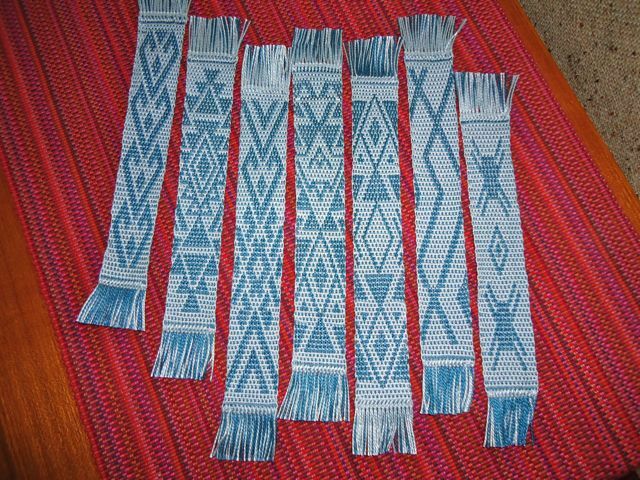 Andean Pick-Up Weave bookmarks. Contents: 100% cotton. SOLD. "Harmony", wall hanging, outdoor banner. Contents: various fibers. $285. Free shipping with the continental USA. "Red, Black & White All Over", moebius/shawl. Contents: rayon, cotton, bamboo, mohair and more. SOLD. "Spider II", banner. Contents: cotton, plus other various fibers. Approx. 8.75"x9", plus fringe. SOLD. "Sedona", rug. Contents: cotton, rayon chenille. Approx. 21"x33.25". SOLD. Contents: silk, cotton, wool, +. Approx. 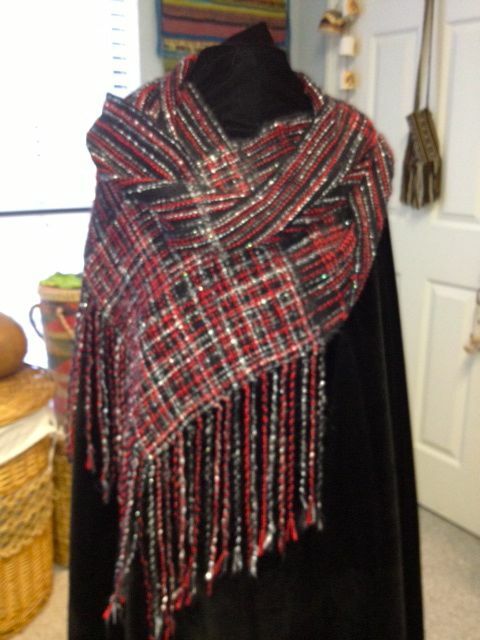 6"x9.5" with sari silk ties at top. 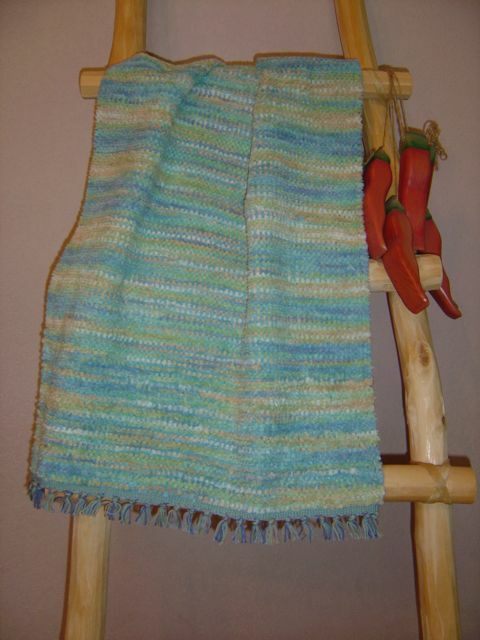 _"Olives and Pesto", shawl. Contents: silk, wool, nylon, mohair. Approx. 16"x62", plus fringe. SOLD. "Chamisa", table mat/ runner. Contents: cotton, rayon. Approx. 15-3/8" x 30-1/4", plus fringe. $85. 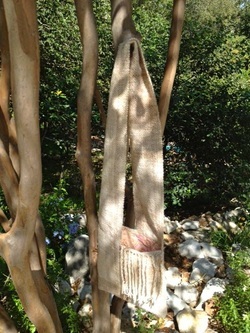 "Totem", wall hanging. Contents: wool, mohair, silk. Approx. 9"x38", plus fringe. $45. Free shipping within the continental USA. 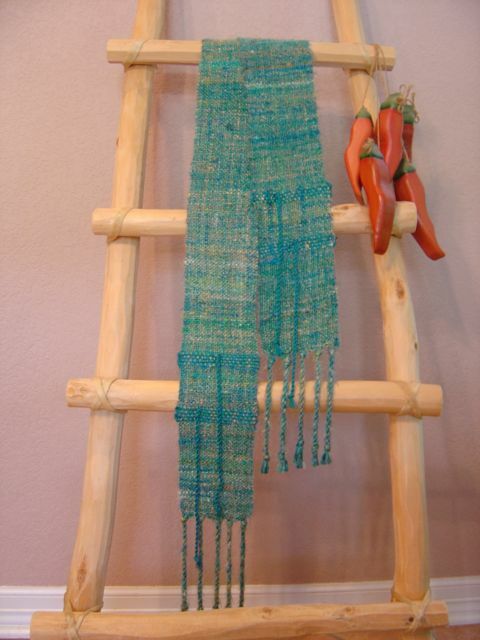 "Turquoise Trail", scarf. 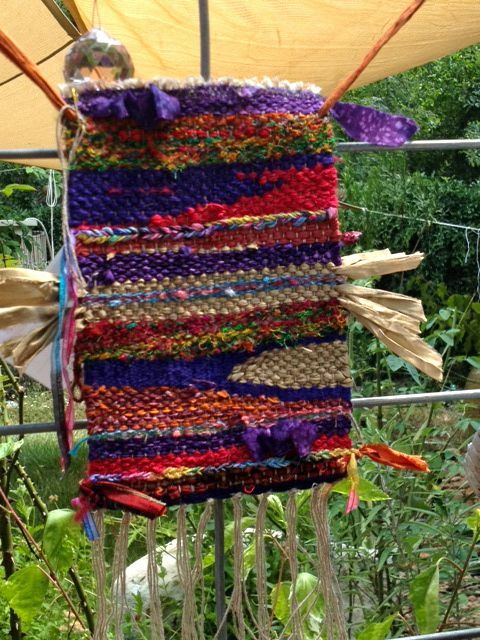 Contents: recycled sari silk, cotton accents. Approx. 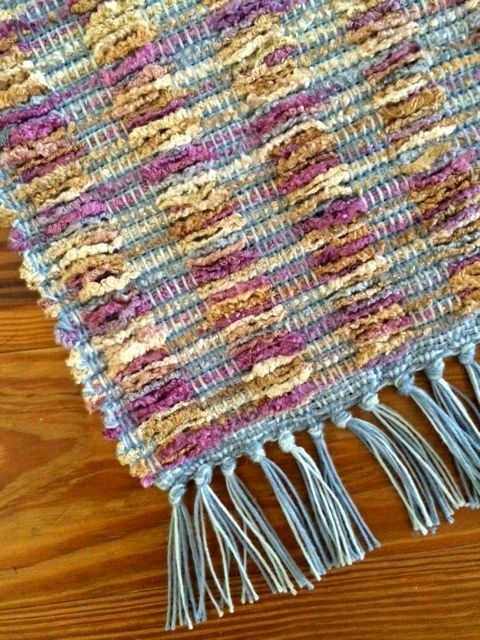 4-1/4" x 77" plus fringe. $68. SOLD. "Ivory Tibetan Bag". Contents: silk, wool. 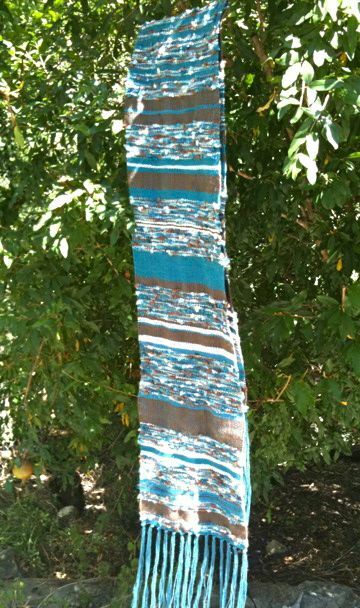 Lined in a lovely, softly colored batik (leaf pattern) SOLD. 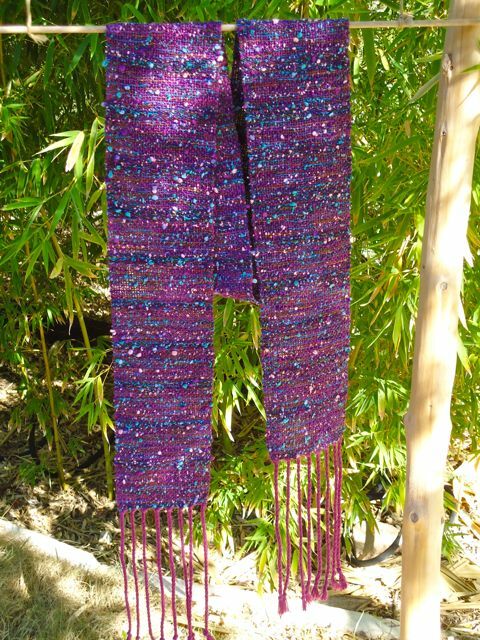 "Splatter Chatter", scarf. Contents: linen, cotton, poly. Approx. 4.75"x67", plus fringe. SOLD. 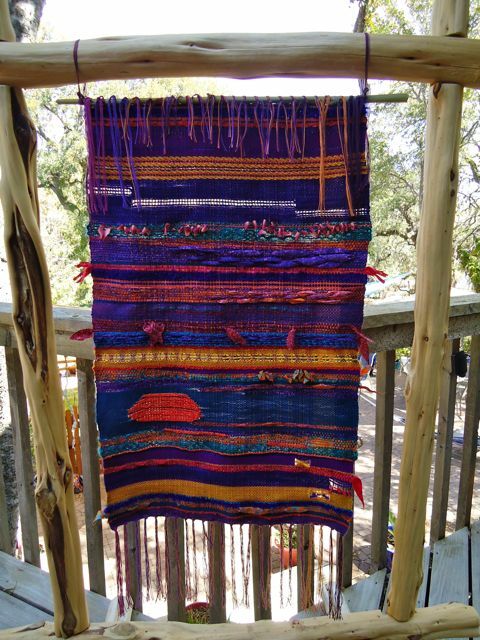 "Mayan Temple", wall hanging. Approx. 12.75"x29", plus fringe. Content: wool, cotton, silk, linen. $149. Free shipping within the continental USA. 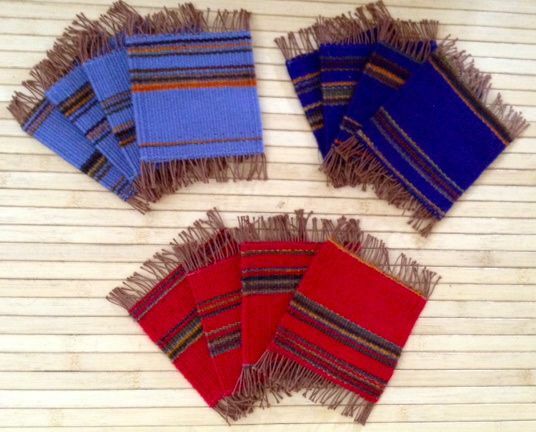 "Wild, Wild West", shawl or table runner. Content: cotton, acrylic, merino, linen. Approx. 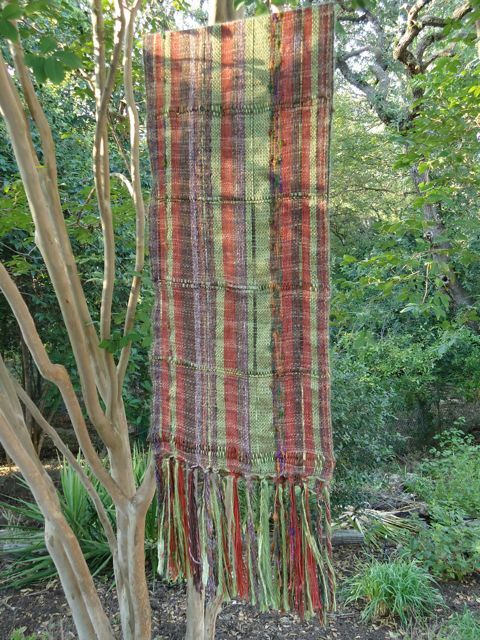 10.5"x69", plus fringe. SOLD. 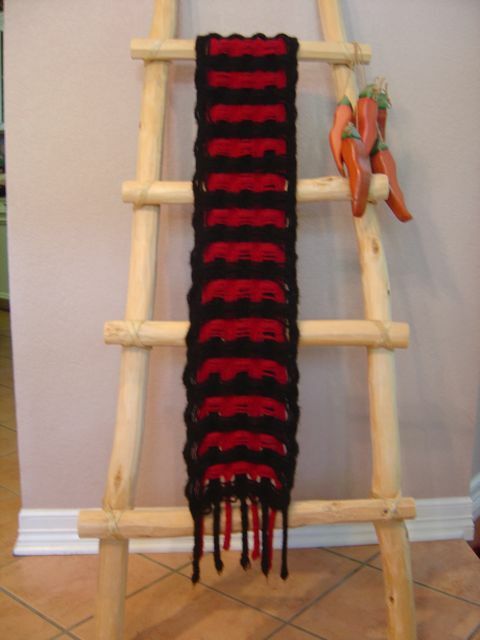 "Ladders of Passion", felted scarf. Content: wool. Approx. 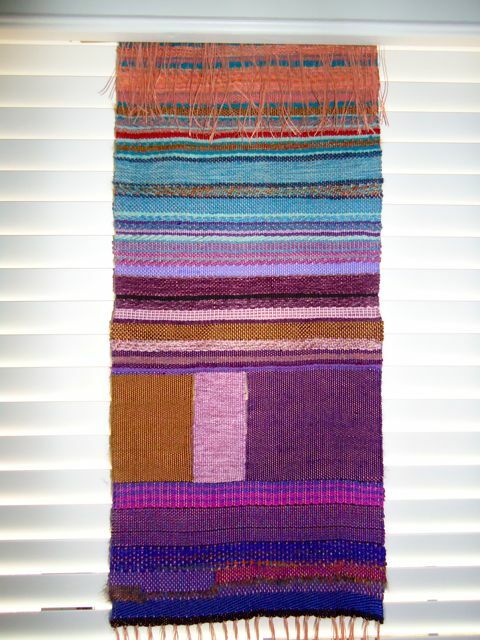 8"x62", plus fringe. SOLD. 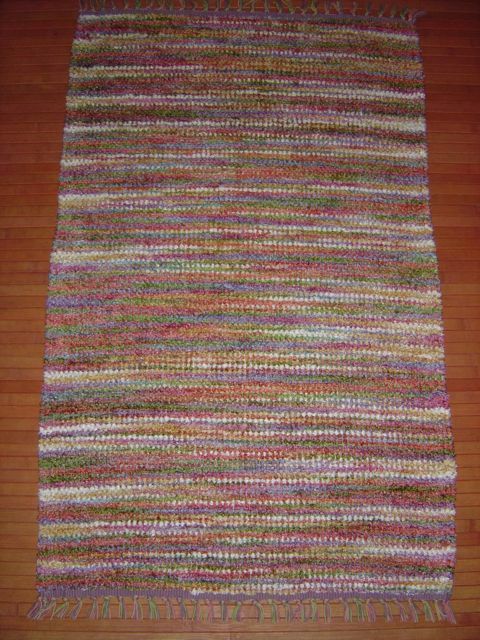 SALE: "Shifting Sands", rug. Content: cotton chenille. Approx. 21"x32". $38. Please email me to inquire about any of these items for sale. Thank you.